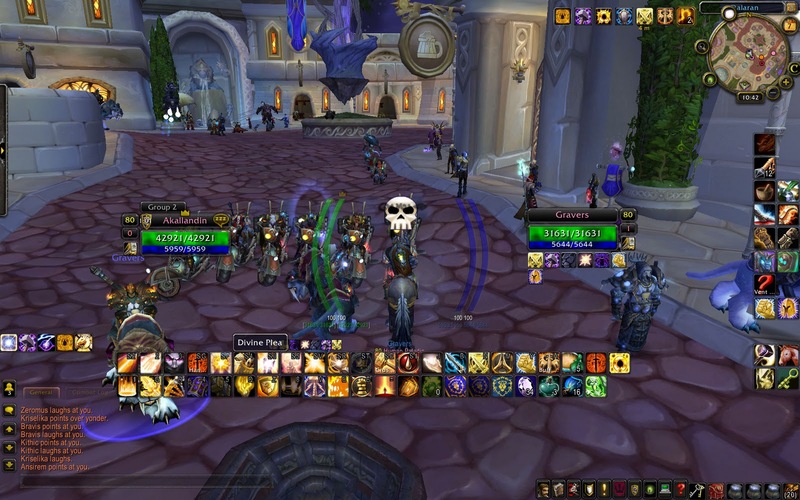 So a couple of our guild mates were getting camped by Kiithsa Hunter again. Anyone heard this one before? They were in Icecrown, but some of us were already in Stormwind chasing down other Horde. Eventually the Stormwind raucous seemed to be under control, so we headed out to help in Icecrown. When we arrived, our guild mates were rezzing up at the skyship. One of them mentioned they were just aboard and killing them. So we buff up, and wait. And wait. Annnnd waaait. About 10 minutes later, Wusah shows up on his flying mount. We try and grab him, or dot him up, but he always managed to get away with his trusty parachute. After waiting for about 15 minutes with nothing else happening, we left. Of course we flew to the armistice area to hearth, not wanting anyone to catch a sap or ganking at the last minute (and they did try to catch poor Brudn before he flew into the tourney grounds but failed). We land in the arena, snap a couple screen shots, mess around and duel, and the Kiithsa Hunter group shows up. They start to taunt us with their emotes, motorcycles, and dragon mounts, then disappear. We hearth out, thinking it was over. In the mean time, all this personal attention is pretty awesome. This must be what it feels to be like the younger child! Yeah, Kyp… Obviously the Kiith didn’t know where YOU guys were to launch an attack. SO IT WAS UP TO YOU!!! Face it, Zeromus or Wusah or whomever you’re trying to cover for being — If the Kiith wanted a standup fight as equals, it should have been worked out in advance, or clarified at the time. Kiith doesn’t have a big bankroll of trust and respect from many of us, and your ongoing little antics do nothing to build it. If you want some fights and hopefully fun for all, try swallowing just a tiny bit of pride, approach people as equals, and treat them with the level of respect you’d want in return, instead of your Kindergarten side-shows. The more you jackwagons brag and taunt, the more and more I’ve grown to dislike and disrespect you. So it certainly has made me much less interested in supporting your enjoyment of the game. Also, I enjoyed the ‘shame’ comment from an anonymous poster. Please email me the screenshot where I said I knew they were there. I’ll put it in this post in place of the group spam photo. In fact if you want to email the entire conversation, I’ll post it here too. It’s not Wusah’s fault you couldn’t figure it out. It was made painfully obvious, and even Akalladin acknowledged that he knew. Why continue to feign ignorance when all it does is make you appear just that? That’s right anonymous, we should have known that Wusah was trying to tell us to come to an open field and fight, by flying up and down on his drake. And because we all know how honorable KiithSa are, we should trust them and just follow them, taking their word for everything. Sounds like Anonymous is a real fan-boy, maybe you should make a shirt and follow them around more often and continue to forum troll. Actually, they were waiting for you in an open field both times they “dissapeared”. They had Wusah repeatedly and obviously run up to you and slowly approach the open battle terrain where they were assembled and waiting, despite your numerical superiority. Zeromus would rather engage you as equals than put on the kid gloves and tell you where to be. According to the screenshots of that conversation, you KNEW where they were, and purposely chose not to engage, citing a list of excuses to include (and not limited to) you were only there to extract your one guild member. You assembled 10 people to run. He gave you ample opportunity to clarify if this was not the case, and you really didn’t have anything to say to the contrary. The fact of the matter was you knew exactly where they were waiting for you to leave your rally point, aknowledged that you knew it, and opted to flee. Don’t make it sound like something other than what it was. There’s no shame in running from a superior force, just don’t deny it either. You’d think with all the dual-accounts available to them, they could have taken the energy to coordinate with you before everything fell apart, rather than just using those resources to taunt you afterward. Oh well. I guess it is the Kiith’Sa way. Previous story All dressed up with nowhere to fight!